President Donald Trump’s initial budget proposal does not explicitly attack funding for the D.C. region’s transit agency, but if the plan’s aim of shrinking the federal workforce is realized, Metro could be damaged at a time when it needs every possible rider. 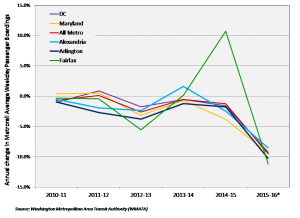 Metro’s average weekday ridership is at its lowest level since 2003. System leaders are anticipating that some commuters will return in the summer after the disruptive SafeTrack rebuilding program ends and reliability improves, but a ridership recovery could be undercut if the Republican-led Congress goes along with the president’s proposal to dismantle parts of the federal bureaucracy. 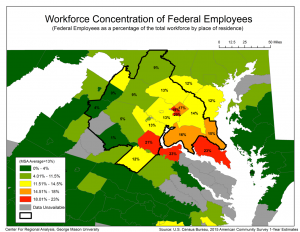 “If you were to look at some of the more dramatic elements of the Trump proposal, we’re talking in terms of what might be that 20,000 to 25,000 federal jobs that would disappear,” said economist Terry Clower, director of the Center for Regional Analysis at George Mason University. A loss of that magnitude would cost Metro several thousand trips per day.